lack of moderation, especially in eating or drinking. Excess in art has for decades represented the innate greed and hunger of the human soul. A depiction of society’s insatiable need for more. More food, more art, more money, more time, more love, more music … more of anything that gives us pleasure in the moment. Photo: Screenshot from Taylor Swift's "Look What You Made Me Do" music video on youtube.com. Drowning in diamonds; a classic pop culture representation of excess. Artwork is a direct reflection of our times, from painting to dance and fashion to music, every creative outlet echoes not only the aesthetic of its respective era but the culture behind said aesthetic. Changes can be seen in the beats, fabrics, and brushstrokes used to create art, in the techniques and craftsmanship adopted and lost over decades of growth and technological advancement. However, the purpose that is at the core of artistic expression has arguably remained unchanged, which it to critique, represent and showcase an idea, which resonates within human society. In this case, we are focusing on humanity's obsession with excess. One of the most potent representations of excess in art is showcased through the use of food. As artists struggle to convey their message, they are aided in inspiration by the most mundane of items, the food we consume in order to survive. Ever since cavemen started painting their prey on walls, the symbolism of food in art became associated with innate need and immense greed or hunger. As humans, we can relate to this common denominator, because food is a necessity for staying alive and not consumed as a choice. In the 16th century, Vincenzo Campi, one the of the first Italian painters to abandon religious subjects and devote himself to painting scenes of everyday life, explores the theme of vanity and excess. As seen here in “Ricotta Eaters”, (oil painting, 1580), Campi paints a self-reflective satirical work, overflowing with details and colors, manifesting the concept of excess during that era. This theatrically staged and gruesomely disgusting scene of people eating a huge chunk of ricotta cheese, mimics the vanity and overabundance of the bourgeoisie. The lack of refinement in posture, attitudes, and clothing ultimately makes the audience think about their lifestyle and the means by which we feed our bodies and mind. 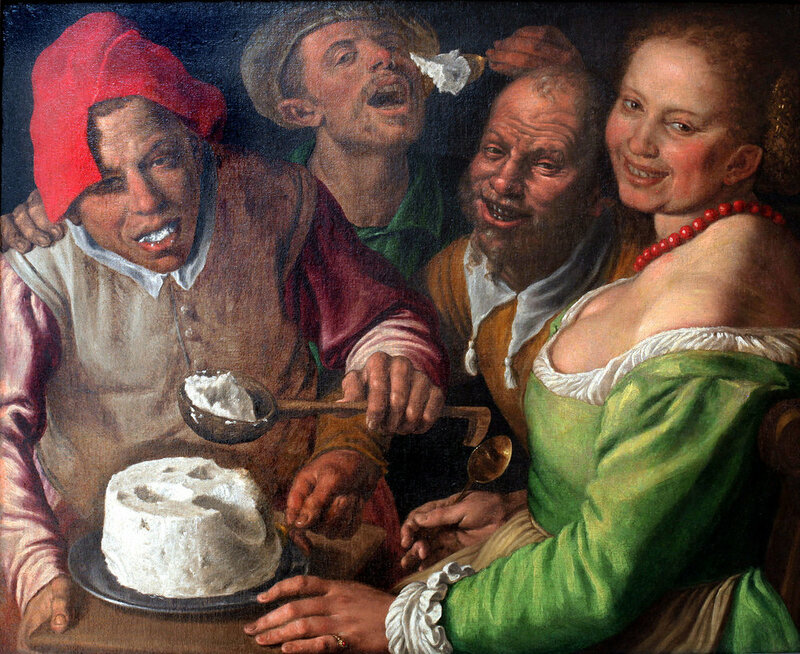 Vincenzo Campi, Ricotta Eaters, c.1585, private collection, Cremona. Another artwork that critiques society’s obsession with excess is the famed “Campbell's Soup Cans” by Andy Warhol (Synthetic paint, 1962). Using synthetically printed ads as his inspiration, Warhol’s artwork is however hand-painted, and is composed of thirty-two canvases, each one with a soup flavor that Campbell's offers. The piece was created with minimalist colors and forms, which contrast the excessive repetition of the soup cans. This juxtaposition aims to shock the audience, highlighting our societies' mass consumption phenomena and our obsession with excess. Andy Warhol, Campbell's Soup Cans, 1962, MoMA. An artwork that really shook its audience is John Baldessari‘s “The Cremation Project” (Conceptual Art, 1970). In a bold reflective statement Baldessari decided to cremate all the paintings he worked on from 1953 to 1966 for his new conceptual piece, and even more shockingly, he used their ashes to bake cookies. The end result of this notorious piece was an urn filled with the ash cookies, the recipe for making said cookies, and a bronze plaque with the destroyed paintings' ‘birth’ and ‘death’ dates. This audacious artwork reflected not only the human cycle of birth and death, but also our society’s obsession with over-creation and over-achieving. We require excess in everything and what better way to point out this phenomenon than by using something so mundane as a jar of cookies. Lastly, Jeremy Scott the creative director of Moschino, shocked the world when his Fall/Winter 2014 collection was inspired by junk food. Giving the McDonalds logo - the ultimate symbol of junk food for our generation - center stage. Scott took a typical waitress outfit and transformed it into high fashion, the shirt turned into an elegant yet colored shirt dress, the sneakers are replaced with pumps, and branded with a parody Moschino-McDonalds double fries “M”. The tray held by the model, serves a Chanel inspired but McDonalds branded purse. The total atmosphere epitomizes our modern society, obsessed with luxury and excess, yet consumed by fast food and fast fashion brands. That even in junk food, we require an overabundance. Art is created to add something to society, be it literally or figuratively or even unconsciously. By exposing the harm we instill upon ourselves, through indulging in excess, we take the first step to finding a solution. Through creative execution, these artists awaken the intellectual appetite of their audiences, using food as the ultimate metaphor for the human soul's need for excess.